These are probably the three most important days of the year for DME/HME providers. If you have been reading my blogs, you know how concerned I am about “tomorrow”. Today, I received an answer from a dealer in the heart of the country. He told me that his company belongs to AAHomecare and is very active with his state association. He said: “Shelly, I met you in Atlanta a few years ago and have been enjoying your blogs. I appreciate your concern about the pending changes in legislation and the need to get the bill HR 4920 passed. I want to you to understand that my company and those of my peers have already melded into a “team,” as you suggest. Best of all is your idea to build teams to work with the associations. We have done that! Thank you.” He promised he would see me this October in Atlanta at Medtrade. I can hardly wait. I know the exhibition will be here sooner than expect. There is much good news about this year’s show; it seems that 95% of the exhibition hall has already been reserved. That is great! AAHomecare, VGM, MED, the state associations, and the multitude of services we require will ALL be there. Everyone I have spoken with told me they are bringing new ideas and programs. Every attendee, vendor, exhibitor, and publication understands what might happen if we do not all work together with AAHomecare and your state association. The list of speakers and lectures is as good as any University could gather. Please sign on now and bring with you as many key employees as possible. Medtrade, this October, will not be a holiday. The reality is that Medtrade Fall is the most important opportunity for your company’s future. Be sure to say “Hello, Shelly!" when you see me walking the floor. In the spring show in March, I lost track of how many people I saw and I want to do that again. After all, this cantankerous old curmudgeon is in his 88th year! I need those hugs and handshakes! There are so many things happening in such a rapid fashion that will affect our industry. To survive these changes, every dealer must become involved. I have spoken about AAHomecare’s need to raise additional funds, and I hope you all responded. I also asked that you build teams to work together with them and your state DME association! Together we will make this happen. Together we will maintain and protect out industry. There is one more battle that we (every DME dealer) must win! All the efforts of AAHomecare, the state DME associations, VGM, MED, and “you” have just received a major opportunity to change the existing Competitive Bidding Program. Yes, we have not succeeded as yet, but we have to get this accomplished now! We will not get another opportunity to change the Competitive Bidding Program. Our industry has fallen short twice to get a bill through Congress. Contact every congressman in your state. If they had agreed to support you in the past, thank them, and please ask them to come on board once again. We have to reach each and every congressman, and with the help of your staff and clientele, we will succeed. AAHomecare appears to be working 24 hours a day, same as all our state DME associations. All of these combined efforts are not just to protect our business. We have a huge number of senior citizens who depend on us. Then there are all our patients, customers, and their family care-givers who depend on our services. Yes, it is right now, there will be no tomorrow. Congress will be on holiday again in a few days. Call, write, work with AAHomecare, support your state association, and send your contribution to AAH. Get involved, because I hate to think about the alternative! Call your Representative today to request they cosponsor HR 4920, the Medicare DMEPOS Competitive Bidding Improvement Act of 2014. The number for the Capitol Switchboard is (202) 224-3121. This is something every DME/HME dealer should do, and is something every DME/HME dealer can do. It is to build a team! A team is “a group of people working together in a coordinated effort”. Every organization, such as a Rotary Club or the American Association for Homecare, started in that fashion. Paul Harris founded Rotary in Chicago with a few local business people who enjoyed having their lunches together. Look at what they have accomplished! AAHomecare began when a “team” recognized it was needed! I am happy to say that in our industry, DME/HME, building teams has already begun. Half a dozen local DME dealers where I live gathered together and arranged to meet their Congressman, Bill Posey. I was flattered when they invited me to attend the first meeting. They were able to show him many of the problems with which they have to contend. These affected every one of the electorate in his District. Congressman Posey assigned members of his staff to work with this “team,” and their relationship is excellent! 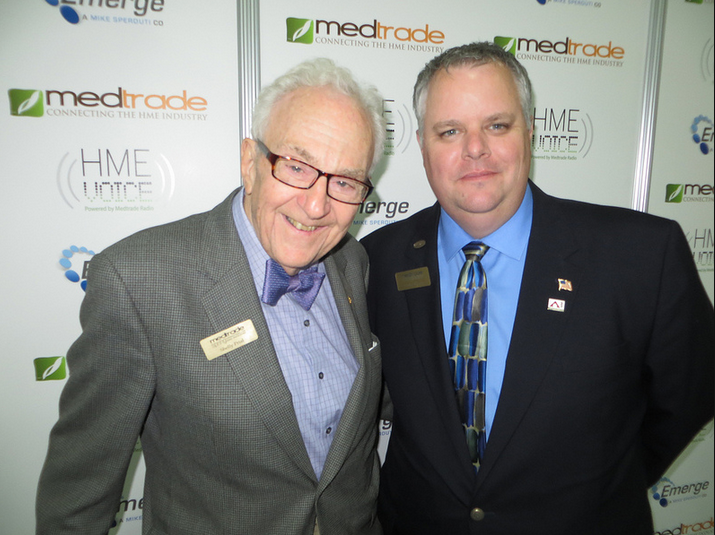 At the last year’s Medtrade, two members of his staff attended. I know we can do this throughout the United States. I have been told that this Florida team is not unique. We have many similar “teams” throughout the country. We are under great pressure to get things done STAT! Stop and call another dealer you know. The pressure that's currently on everyone’s back will force hundreds of dealers to close their doors. AAHomecare is leading the battle. But they cannot do this alone. They are now in the process of raising sufficient money to keep your company solvent. Unless AAH can obtain the necessary funds, you and so many providers will be forced to close. If you are not currently a member of AAHomecare and your state association, you should join now! When every dealer understands what is happening, and puts “their money where their mouth is”, they will save our industry! There will be no tomorrow if you do not. Every penny counts! AAHomecare has launched a new program, which they call the “HME AUDIT KEY”. They are following the lead of the American Hospital Association (AHA). It is in place as a RACTRAC survey tool. In these first two weeks, the AAHomecare Executive Committee and Board of Directors, along with VGM and MED, have already collected $43,500. AAH has contacted Provider Consulting Systems, the one AHA has signed on with. Try to imagine how an audit by CMS would affect your company. There are so many ways that CMS (Medicare) is seeking to reduce fraud and abuse and save them many dollars. Fraudulent billing is committed by dishonest companies, organized by thieves who stay active until caught and then they disappear. The problem is that all the hard working companies, run by honest, diligent families and their employees are the ones who get hurt. How would you, an independent DME dealer, respond to an audit? The time necessary and the cost to fight this alone would be prohibitive. All the pro-bono services your clientele has come to expect no longer means anything! What would this prove? How will you face your employees, their families and all your customers and tell them you are forced to close your doors? This will not happen if and when you become involved. Your support and complete cooperation with AAH will help you maintain your company. Don’t wait until it is too late! We can no longer sit and watch. We have to back up AAHomecare by becoming a dues paying members now! If you wait too long, you may find your company forced to close. We do not have any time to respond, this is already happening! We have to follow the lead that AAHomecare has set in place. YOU HAVE NO CHOICE, EVERY DME/HME DEALER MUST SUPPORT AAHomecare. THEY MUST RAISE $250,000 STAT! YOU MUST SUPPORT THEM SO AS NOT TO FACE SOME VERY DIRE CONSEQUENCES. For nearly 65 years, I have been listening to success stories from DME/HME dealers. Actually every dealer is a success, and when their company continues to grow, they are successful. Too often, many remain where they are and run very nice professional operations, status quo. But I look back I see there are still many who are working very hard just to remain a “success”. These dealers can grow and really become “successful”. Yes, they currently are making a “living”. They all employ a few staff members and are satisfied with what they are doing. But I enjoy working with those dealers who are truly SUCCESSFUL. These are the dealers constantly doing everything possible to maintain and develop more sales. They do more than just wait for a customer to come in! They actively invite the community to shop at their location. Their staff is calling on referral sources and selling supplies to other business people. They are the first to bring new products to the market. These dealers belong to the Chamber of Commerce, are active in Rotary and other civic associations. The key to them remaining successful and constantly expanding is that they do not stand alone! With so many things constantly happening in Congress, with reimbursements and legislations being proposed that could be fatal, they do protective things. Every dealer must work together! They belong to AAHomecare and their state DME associations. They read and study the industry publications. They are the first to attend the Medtrade Exhibitions, where answers are found, new opportunities are presented, and the state associations and AAHomecare will help you resolve problems. At Medtrade is where the best classes and seminars are waiting for you. At Medtrade in Atlanta (October 20-23) you will meet many very SUCCESSFUL dealers. It is just a few months before the Fall 2014 Medtrade Exposition opens the gates in Atlanta! More than 93% of the exhibitors have already signed on. Many of the vendors who had previously either downsized or neglected to attend are now signing on. This year, attendees will be able to meet with many new vendors, discover many different opportunities, and attend interesting seminars! Make your reservations now, get your motel rooms at a better price, and negotiate. See how many members of your staff you can bring with you. This is a great investment, which has for you a large ROI! This Medtrade will be the beginning of a new and better opportunity than we have experienced in many years. Why? This is happening because suddenly our congressmen and CMS have finally recognized how valuable DME/HME providers are to the general public. The voices of the beneficiaries are now being heard loud and clear. Your company has to get on the bandwagon ASAP! Don’t procrastinate; start planning now before time runs out. Tom Ryan and AAHomecare have been at the forefront leading the industry. The state associations are finding more and more time to communicate with their elected Senators and Representatives. Our industry has a magic wand, and is finally using it! We work with our customers, patients, and family caregivers, all of whom vote! They are the reason why our voice is being heard. Bed-pans, urinals, and fracture pans, when offered at a special price for a limited time only, will prove to be a fantastic magnet to attract customers into your showroom. No one ever purchases some of these items except when one is required. Purchase a few cases each of bedpans and urinals. In the past, we found that about 100 to 125 each of the bedpans and urinals and then 50 or 60 fracture pans will sell out in a few days. If you are in a high trafficked location, you can order a few more. Be sure to order them loose (bulk), not boxed or packaged. Completely empty a main display in the showroom and stack these up as high as you can. Add large price-marked signs, a big one in the window, and signs on the displays. This sale is for five (5) days only (Tuesday through Saturday). Price mark each about double your cost. You can mark them a dollar or so higher if you negotiated a decent price from the vendor. Every customer who sees this, and the low price offered, will stop, look, think, and usually make a purchase. We found that each sale was generally one of each! When I had my company, we did this annually in September. I don’t know why we chose that date, but we always sold out nearly every unit. The success of this type of promotion is that you are offering something everyone recognizes, especially senior citizens and family caregivers. One of the special things you will discover this Fall in Atlanta at Medtrade will be many new ways to build more OTC cash sales. I always speak with many vendors when I go - Be sure you see them all! I will be there and I hope to meet some of our readers there. Thelma and I decided to take a brief vacation. All of our family are scattered about the country, mostly in the North East, and we are located in Florida. Our Grandson in California was heading home, so we decided now was the proper time to go see them when they were all close together! We did! We traveled from Florida to Vermont, Massachusetts, Connecticut and New Jersey (all in eight days). Thelma and I experienced some very hectic days, but they each were very rewarding. We had a team of chauffeurs; our daughter, our son and eldest grandson did a super job taking us to all the centers of activity we sought (and they received no citations!). I am sending this to all of our readers. It is imperative to take a break from working, and how better than via a brief holiday? When I ran my pharmacy or DME, I felt I had to be there whenever the door was open. How wrong I was. I am aware that every one of you feels the same as I did. I was a workaholic. Don’t become one! A great opportunity awaits you! This will be where you can take a few days for yourself in Atlanta (a great city to visit) and then you will also return home armed with new ideas to build new sales and profits. Allow your workaholic half a few days at the annual Medtrade Conference and Exhibition, October 20-23, 2014, at the Georgia World Conference Center, and of course have a few days of fun and pleasure. Thelma and I have done that for years. If you trained your staff, they will pleasantly surprise you. As a matter of fact, they may be even better! Don’t hesitate, take a holiday. I received a report from AAHomecare that made these hectic days much brighter for me (and you). AAH sent a team headed by Kim Brummett and Heather Boyd with six members of their Regulatory Council for a “face-to-face” meeting with CMS. Ours is a busy profession, but it is under attack for some reason by CMS. They have the wrong impression, brought about by the great deal of fraud and abuse they have to contend with. But the DME/HME dealers are not the problem. Most are all hard-working professionals who often provide as much pro-bono as possible. We all are writing letters, sending emails, making phone calls to our Congressman to get new legislation through Congress. This is all vital, but a face-to-face meeting can accomplish so much more. Those of you who participated in the Washington Fly-In know this to be true. This is a major role that AAHomecare performs which is so important for all DME/HME providers and dealers. When I finished reading the report in my e-mail, I was so excited to realize that AAH was able to do this. By our industry maintaining direct communication with CMS, you will be able to remain in business. But, how long can AAHomecare continue these efforts? There are far too many “Freddy free loaders” who are not dues paying members. There is no excuse for this. When we all get on board, our industry will flourish. I do not want to contemplate the alternative. So please pick up the phone and join AAHomecare, STAT. Please call 866-289-0492 or 202-372-0107. For a very minor investment (ask your accountant), you will be sure to stay active in business, not be obliged to fold your tent! WOW! School is out and so the next few months should be filled with new ideas and means to attain all your goals. There must always be a holiday taken, one where you and your family can relax and enjoy yourselves. I know that for the past 64 years, both Thelma and I always found the time and place to do just that - relax! But we also did a little bit extra while on holiday; while away from the office, we were able to quietly review what we did and where we wanted to go next. We found that this was accomplished without any pressure. It proved to be a great opportunity to discuss and plan for the balance of the year. The first thing we constantly discussed was the pending Medtrade Exhibition and Conference in Atlanta. These have become very special, extremely important, and comprehensive! I sincerely believe that every DME/HME provider must attend. There is nothing else that offers so much! There is no other place where you will chat with your peers, speak to the exhibitors, see the AAHomecare team, the state associations, the seminars, the buying groups, and meet the publishers of the industry magazines. There never was enough time for me to go to all of these. Thelma and the "key employee” who came with us attended so many which provided new ideas, new techniques, and new ways to increase sales and profits. It was our university! Which of our employees have earned the privilege of attending with us? We could not take them all (somebody had to run the business), but they shared everything with one another. Over the years, the ROI we received when one or two of our key personnel came with us was very large and is a superb investment. So even when school is out and you are on holiday, remember all this comes from the hard work at your operation! When school is out is your opportunity to enjoy with your family a holiday. Think about how hard you worked to get there and then what you will do to make things even better.